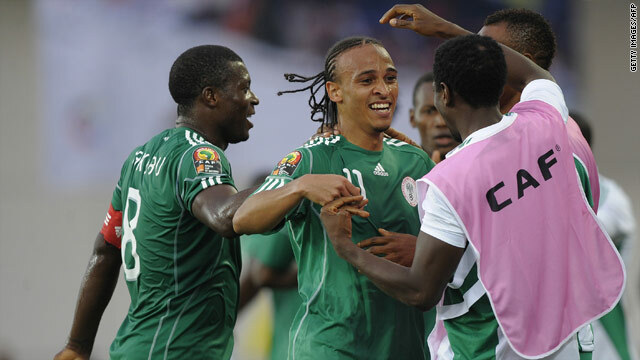 Nigeria's Osaze Odemwingie celebrates with his teammates after scoring the second of his two goals against Mozambique. Nigeria joined Group C rivals Egypt in the quarterfinals of the Africa Cup of Nations after they completed a 3-0 victory over Mozambique. Osaze Odemwingie struck either side of halftime break for Nigeria before Obafemi Martins scored five minute from time. Defending champions Egypt cruised into the knockout stages with a 100 percent record after a routine 2-0 victory over Benin. Egypt qualified with nine points and Nigeria went through with six while Benin and Mozambique ended with just a point apiece. (CNN) -- Nigeria joined Group C rivals Egypt in the quarterfinals of the Africa Cup of Nations after they completed a 3-0 victory over Mozambique on Wednesday. Osaze Odemwingie struck either side of halftime break for Nigeria at the Tundavala Stadium in Lubango before substitute Obafemi Martins sealed victory for the the 'Super Eagles'. Nigeria had enjoyed the majority of possession and took the lead moments before the interval when Odemwingie found space inside the penalty area. The Lokomotiv Moscow midfielder was able to take full advantage and rifled a low near-post shot past Mozambique goalkeeper Joao Rafael and into the net. Shuaibu Amodu's side doubled their lead two minutes after the break when the unmarked Odemwingie was able to control a cross from Yakubu Aiyegbeni and tap the ball home from close range. Everton striker Yakubu was substituted and replaced by Martins who got his name on the scoresheet five minutes from time. John Obi Mikel punished some sloppy Mozambique defending but lashed a shot straight at Rafael who parried the ball into Martins and he confidently stroked the ball home. Defending champions Egypt cruised into the knockout stages with a 100 percent record after a routine 2-0 victory over Benin which extended their unbeaten run in the Africa Cup of Nations to 16 games. Egypt coach Hassan Shehata rested key players Ahmed Fathi and Wael Gomaa but they still had too much quality for Benin and took the lead in the seventh minute with an audacious effort by Ahmed Al-Mohammadi. The defender lashed an ambitious shot from long range which caught Benin goalkeeper Yoann Djidonou off his line and dropped into the top-right corner of the net. Egypt doubled their lead in the 23rd minute when Emad Motaeb was able to bundle the ball home from close range after Ahmed Raouf's header had been parried by Djidonou. The win ensured the 'Pharaohs' qualified with nine points at the top of Group C and Nigeria went through with six while Benin and Mozambique end their campaigns with just a point apiece.